As recently as 10 years ago, humans were thought to be the only species with the ability to plan. Recent studies on great apes showed the ability is not uniquely human. Now, scientists in Sweden have come to the surprising conclusion that ravens can also deliberately prepare for future events. Ravens' ability to plan ahead may have developed in reaction to their complex social hierarchy. "It is conservative to conclude that ravens perform similarly to great apes and young children," the researchers write. However, monkeys have failed similar experiments. We've known that ravens, and other members of the corvid family, are smart. Previously, they were shown to think ahead by caching food to eat later. But some scientists argued that food caching was not proof of an ability to plan because the birds could simply be biologically wired to do so, cognitive zoologist Can Kabadayi from Lund University tells The Two-Way. 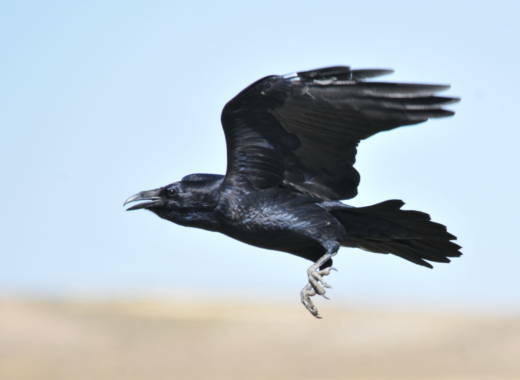 So, Kabadayi and co-author Mathias Osvath set up a series of experiments to see if five ravens could flexibly plan during tasks that they don't do in the wild: using tools and bartering. These are similar to studies done on great apes. Their findings were published Thursday in the journal Science. The researchers trained the birds how to use a simple tool, a rock, that could be used to open a box containing a treat (a piece of dog food) if the birds dropped it through a small tube. They then tested whether the birds could pick the right tool from a series of "distracter" objects — such as a wheel, a ball, a metal pipe and a toy car — then save it and use it later to open the box. One version of the experiment had a delay of 15 minutes between selecting an object and being presented with the reward box, and the ravens succeeded 86 percent of the time. The second extended that period to 17 hours, and the success rate was even higher, at 88 percent. The birds were also trained to use a specific token to barter with a human for a food reward. Then, a different experimenter offered them a tray with the token on it along with other distracter objects. "When the ravens knew that trading would only happen on the next day, they chose and stored these tokens as soon as they were offered to them," scientists Markus Boeckle and Nicola S. Clayton wrote in a separate Science paper on the Lund University research. The researchers found that the birds would tend to opt out of immediate food rewards because of the promise of larger, tastier treats later. They were more likely to be willing to endure delayed gratification when they had to wait only a few seconds, rather than minutes for the larger treat, which is also a key component of human decision-making. "We basically found that the further ahead in the future a reward for ravens, the less value it gets," says Kabadayi. It's safe to say that ravens and mammals have not inherited planning skills through a common ancestor, says Kabadayi. They last shared an ancestor about 320 million years ago. To plan, "you need a lot of different skill sets to work together and that's interesting, because how can that be similar between corvids and great apes given they are so different to each other evolutionarily?" says Kabadayi. The skills likely evolved independently, through convergent evolution, he says. Why would ravens develop the ability to plan? Kabadayi says there are many different theories. He says this kind of complex cognition may have developed in reaction to ravens' complex social hierarchy. For example, they would need to remember previous interactions with other birds, which could contribute to memory and planning skills. However, he says there are many other hierarchical species that don't have planning abilities. Factors like environmental pressures or the fact that they are scavengers competing with each other could also contribute, he says. The sheer density of neurons in a bird's brain, even though it is small compared to apes, might also play a role. Kabadayi says that scientists would need to test a large number of species for their abilities to plan, and see how this correlates with the possible explanations. Parrots would be interesting to test next, he says, because they have a "huge number of neurons in their brains" and have been shown to have good memories.